To open the properties of the ACT server right-click the ACT server in the results pane and select Properties. Alternatively you can select Configure ACT Server in the Actions pane or click the Actions menu and select Configure ACT Server. 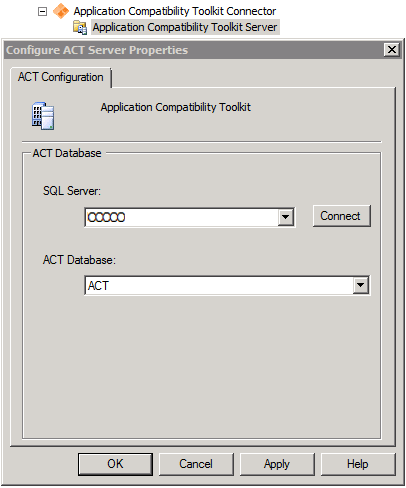 To specify the Microsoft SQL server that contains the ACT database type the name of the server and click the Connect button. Alternatively, you can click the drop down and select Browse for more to open the Select Server dialog box. Select the server you want to use and click OK. Specify the ACT Database to connect to using the drop down and selecting the database. To close the ACT Configuration properties dialog box, click OK.
[-2146232060] Windows NT user or group ‘DOMAIN COMPUTERNAME$’ not found. Check the name again. ‘DOMAIN COMPUTERNAME $’ is not a valid login or you do not have permission. Microsoft will not be releasing a fix but the following modified script can be used to configure ACT connector to work with ACT 5.5 install, just change XXXX in the script as per the comments.
' the ConfigMgr server where the ACT Connector is installed. The script gave me an ‘unspecified error’ in the .addlinkedserver line until I added the SCCM-server’s machine account to the local administrators on the ACT Server. Now it is running. Glad you got it working – did you try the optional parameter? Yes, we have ACT on a different server so I had to use the optional parameter.